I find it hard to believe that this issue continues to wash around our political landscape, with so little positive effort to resolve it. The Foreshore and Seabed issue has been going on for – what – five years now? and is still a stinker. And yet, on the surface of it, this issue is a simple one to resolve. The Fish is presumptuous enough (as always) to seek to resolve this, and move on. Enough, already! There are really just three issues at stake here, which keep getting muddied by the waters on the foreshore. The first issue is Access. The second issue is Ownership. Both of these keep getting muddied by the last issue: Fairness / Equity. I’ve been following this issue unravel and unravel for a number of years, continually amazed at the inability of the politicos to get it wrong, to screw it up, to propose manifestly stupid and unfair ideas over this most basic part of the NZ constitutional right to exist. Putting aside issues of race (for a moment, bear with me), the issue of Access is the one that we all thought we had, until we found out that we don’t. 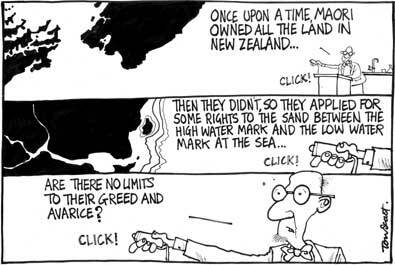 Brought up on the firm ground (so we thought – now we hear it is a myth) of the notion of the Queen’s Chain (Victoria, natch, not Liz), the principle founded in NZ is that all people in this country should have the right to walk around the edge of our land. Its not really a difficult concept to understand – one that we have got, nearly everywhere, being the right to dig your toes in the sand where the beach meets the sea. Apparently, as the Queens Chain was not set in law early enough, we do not have an even boundary of 22 yards beset all around our green and pleasant isles – only about 2/3 of it. Even where we don’t have the QC to walk on, we at least have the principle in strong understanding – in NZ, we are allowed to walk along the beach. The resolution to this is simple: establish Principle One: All should have Access. The second issue is even simpler: it makes no difference to those who walk on it, as to who Owns it. I couldn’t give two hoots whether the beach I walk on, or swim in, is owned by the Crown, by the Public, by someone Private, by Maori, by Pakeha, by Tongans, Chinese or by Aliens from Alpha Centauri – or, as was promoted this week, by the legal entity of the Treaty of Waitangi itself. Really – honestly – it makes no difference to me, or to you, or to anyone. If we’re allowed to walk, play, or swim there, then we’re allowed to and we will. It is only if we are not allowed to, that we want to know – who said that we can’t? What right have they got to say that? So the true answer to the second issue is – I don’t care: it just doesn’t matter. As long as whoever Owns it understands completely that under no circumstances can they sell off any of the land in question, and that Principle One is always maintained, then we’re all happy. So, Principle Two is also simple: It doesn’t matter who owns it, Nobody can sell off the Foreshore or Seabed land, and No-one can interfere with Principle One. And that is where issue Three keeps coming into it: Equity and Fairness. It is just simply, obviously, massively and manifestly unfair that Maori land should be treated differently from any other land. Why should Maori owners be asked to compromise more than the Crown? Why should private owners (read, mainly pakeha, mainly corporate) not have to comply with issues that others (read, maori, mainly hapu / iwi based) have to? Clearly there are exceptions. But the law should be applied everywhere, and exceptions sought, rather than exceptions applied in a blanket fashion as in: if you’re a farmer or a corporation, then you don’t have to comply with this. If you’re a farmer with lands right down to the sea, then the rule should apply to you: you can’t sell off that land, and you can’t stop people walking along it. If you’ve got a role in some land under maori ownership (a special category of land ownership apparently), then the rule should apply to you: you can’t sell off that land, and you can’t stop people walking along it. If you are a business that owns land that goes right down to the sea, then the rule should apply to you: you can’t sell off that land, and you can’t stop people walking along it. And that is the only real sticking point, and one where we have to be reasonable about: places like Centreport rely on that interface between water and land, so an exception obviously has to be made for them there, in the areas that they need. But everywhere elsewhere: then the rule should apply to you: you can’t sell off that land, and you can’t stop people walking along it. So: Principle Three is: Be Fair. Do No Evil. Apply law to Maori and Pakeha alike, Corporate and Private alike. There, that’s it. The law is resolved. I’ll leave the boring details to the boring details persons. There are other issues obviously, like who has the right to use the foreshore or seabed for fishing / fish-farming? Well, that’s what we have Councils for, who have a legal obligation to take into account of the Treaty of Waitangi, and I expect them to give due consideration to those issues, and make fair decisions, as long as they have no effect on the principles 1, 2, or 3 above. But basically, that’s all sorted out then. Right: on to the next issue. What’s troubling you? You can’t just say you don’t care about who owns it, that’s one of the key things about the legislation! Without that being resolved, nothing else will get sorted! Aaah, but I can say that, and I do say that. And really, so should you. Establish these three principles as a governing, over-riding framework, and the lawyers can spend the next 100 years for all i care, arguing over who owns a particular scrap of land. But as long as the 3 basic laws are being fairly applied, then it doesn’t make any difference to all of the rest of us. The reality is that no-one owns the sea. That’s just silly. And so, no one can own the land where the sea comes and goes. That’s the principle – first law applies everywhere. Second law applies, as long as it doesn’t interfere with the first law. etc. I’m having difficulty reconciling your indifference to who owns the S&F as long as they observe Principal One, and a ban on sale, Principle Two. Surely as long as the sale incorporates legislative or contractual adherence to Principle One you can have no objection. Otherwise we’ll never get to test our indifference to ownership by aliens from Alpha Centauri. Clearly if Principle One applies to all, it applies to all, and Principle Three is redundant. Goff/Labour Party must be really rueing the day somebody in Cabinet got the willys over the prospect of the Maori having title. I’d go along with your suggestions, but also add that not only Alpha Centurians et al can’t sell the foreshore, they can’t also block it off by fences, or other means, from the general public. I am having trouble with principal two. As long as the entity who lays claim to the foreshore provides unrestricted access to it, why can’t they sell it? If the purchaser abides by principal one then the land could change hands every week. As you state it doesn’t matter who owns it, but somebody has to own it or lay claim to it, even if that is the Crown. The ‘people’? Or a few individuals in government who could do what they want with it, under the guise of being democratically appointed to do so. Great post Maximus, I doubt this issue is ever going to just disappear. hmmmmmmm……. Hamish, Spencer, you have a point there. I think I agree. The point of Principle 2 therefore is that even if you could buy the land, you still can’t do anything with it, because of Principle 1. Meanwhile, as you say, Principle 3 is just there to keep the law-makers on their toes really. They were at it again on the radio this morning – one iwi had signed over its land, the other iwi had it confiscated – and they are going to have the lands treated differently by the law. No, No, No : all should be equal under the law. I’m not quite sure where to start here, but here goes. How can you write about the Maori relationship to the land and sea and only use English terminology? Sure, Access, Ownership, Fairness and Equity are important, but if you can write a post about this without referring to concepts such as mana whenua and kaitiakitanga, then you’re never really going to get the point. Secondly, it’s rather disingenuous to imply that this is all about walking on the beach: the coastline is not all beaches, and walking is far from the only thing that people want to do with it. People who own land generally expect to be able to use it economically, which often involves building stuff and/or restricting access. You very briefly touch on aquaculture (a touchy subject for a fish, perhaps? ), but it’s uses like that that are the major issue. If an iwi believes that they own a particular stretch of foreshore and seabed, and want to start an aquaculture business there, they could quite reasonably object to people trekking through and nicking their mussels. If that sounds outrageous to you, then perhaps we should demand the right to roam through all the container wharves, naval bases, boatsheds, private marinas, motorway causeways and other privately- or crown-owned bits of coastline. If you make the exception for Centreport, why not make it for Maori coastal businesses as well? Also, there might be many non-commercial and indeed Maori-specific reasons why an iwi might want to restrict access to particular stretches of coast. It sounds all common-sense-y and folksy to talk about “the right to dig your toes in the sand where the beach meets the sea”, but not all traditional “rool kiwi” uses of the beach are so benign. Should we all have the right to hoon around with quadbikes and trail bikes across someone’s pipi beds and wahi tapu? Should the local iwi have the right to place a rahui on their beach to protect a resource or respect a tragedy? Finally, we’re not talking about Alpha Centaurians, and to introduce such abstractions is to ignore the specific history and culture of Aotearoa New Zealand. We’re talking about a particular place, a particular people and a particular culture: not aliens. There is also an issue around access to the justice system. The government shouldn’t legislate to remove your access to the courts, just because your skin is brown. Labour’s legislation amounted to nationalisation without compensation and with no right of appeal. Aaah, Landless, I was waiting for a question like yours to pop up. I have deliberately left the bi-cultural issue out of this discussion as much as possible, as because I am firmly of the belief that ultimately we are all of the same human race. Therefore, I’ve also left out Maori words and concepts, that are / may / do differ from those in English. I’d go so far as to say that the concept of kaitiakitanga has different interpretations amongst maori as well as from pakeha vague equivalents in the english language (there is, of course, no directly comparable word in english for that concept of kaitiakitanga). However, the point of my post is that these rules should apply to all, and, point 3, fairly. That’s my point – the larger legal principles need to be established first – we already happily have rules like rahui that exist alongside rules like keep out of the naval base. I’m quite happy to be told not to pinch someone’s toheroas, and don’t mind if I’m told that by a Council or an Iwi authority. However, if either of those tries to build a series of houses or some such on that land, then I’d be livid – because I believe they should be subject to rules 1, 2, 3 as stated above. The introduction of Alpha Centaurians into the mix was not necessarily just a glib statement, although I always knew that would annoy some people. The point, which I think you know I am making, is that the rules should apply to all, and not just single out maori to be shat upon at a great height by the corporate pakeha world. So: of course I agree that if there is an exception to be made for Centreport, then there are exceptions to be made for Maori as well – but only where there is valid reason. 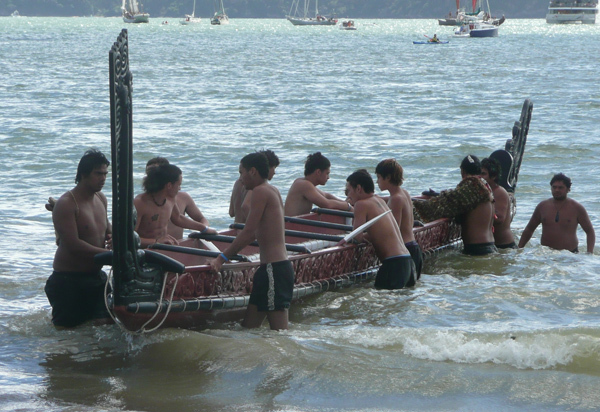 A waka launching pad is just the same whether that ship be the Arahura (interislander) or the H?nakip?kau-o-te-rupe (bay of plenty iwi). and regarding Aqua-culture – which of COURSE affects me greatly – again, it matters not really whether the ropes and cages of mussell beds and salmon farms are owned by pakeha, maori, private or corporate – and who can really tell nowadays anyway, with Sealord owned by Ngai Tahu and thereby covering just about all the bases in one – but the decisions as to who can put the mussell farms there needs to be ruled over by someone – some Body – some Council, whether Tribal or Civic. I don’t really care – it affects me not – I am happy as long as I can have confidence that whoever is making those decisions is doing it fairly. So: point 3 again then…. I think we can put that one down to the work of the Fish and our readers. It’s clear that both Pita and John are regular readers of the Eye of the Fish. Ka pai ! So, if that’s solved, then there’s an Oil Leak that needs your attention….